Today intellectual property (IP) comprises an increasing share of firms’ resources and IP rights (IPRs) are important sources of competitiveness. Consequently, there is an increasing interest in how to properly manage IP. IP lawyers need to better understand business decisions and business managers need to better understand IP law. These needs are addressed by a growing area of research on IP management in the intersection between IP law and management. 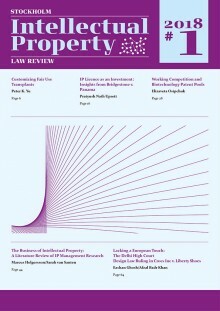 This article presents a literature review of the broad field of IP management research, with the aim to provide IP law practitioners, managers, and academics with an overview of what we know about IP management, to guide readers in how/where to learn more, and how to move forward in both research and practice. A general conclusion is that the research is rich and quickly growing, but has too little focus and data on strategic IP management issues. Both research and practice need to adopt a more holistic perspective on IP, including different rights and integrating with strategic decision-making. Published in Stockholm Intellectual Property Law Review, Vol. 1, No. 1, pp. 44-63.